Today was such a perfect warm, sunny day! I got soooo much done outside! I finally found another guinea nest. I got the D'Uccle pen's fence moved to exclude the pond. The D'Uccle babies hatched and mama decided that 4 was enough so she ditched the rest of her eggs. *sigh* She took the babies out to play, so I took the rest if the eggs and stuck them in the incubator. I candled all the Silkie eggs in the nest boxes and tossed the duds. I moved the last of the Tiger Lilies to the front yard so the chickens will stop eating the flower buds. Maybe I'll finally get some flowers this year! 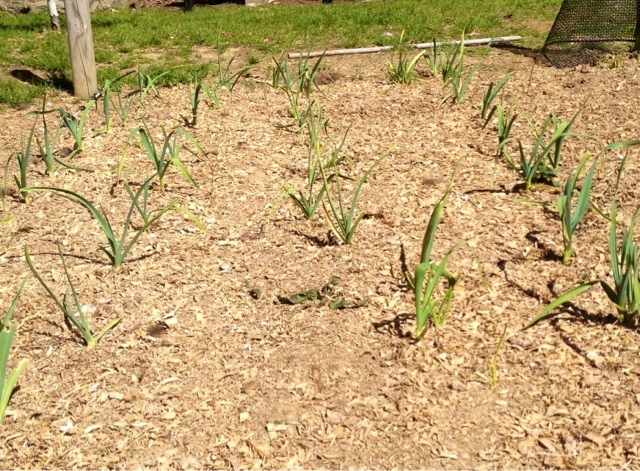 I picked a bucket of rocks out if the garden and checked on the garlic's progress. I think it's coming along nicely this year. Finally, I helped the guys cut and stack firewood for next winter. Whew! What a day! Thankfully it was a beautiful day to work outside. I didn't get a thing done at home yesterday since I worked a double shift. :-( What did you get done this weekend? Your garlic looks great! Something I have wanted to plant in the garden. Maybe this year. Thanks! You should try it....it's super easy. Just plant in October and it starts popping up in April!